The Fennex Augmented hearing app offers an augmented hearing to enhance social experiences and at the same time overcome listening situations that appear challenging. 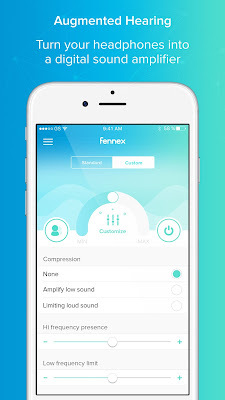 Fennex Augmented hearing app for iPhone turns your headphones or in this case the Apple AirPods into a digital sound amplifier. God ahead and select the scene that fits your listening situation the best, well also, you can customize any sound to fit your needs. The App is compatible with several wireless headsets and can work on your iPhone, iPad, and iPods. The app comes up with a brilliant idea to use the technology for hearing aid purpose. Augmented hearing is a relatively new experience in the social world. A typical smartphone comes with the default audio settings, and there is very little one can do to tweak the volume or boost the equalizer. With Fennex Augmented hearing app, you can easily amplify the sound around you and adjust sound pitch levels to your needs. The app brings predefined setting allowing users to find which setting works best for them. Standard hearing aids amplify some frequencies more than others do but Fennex Augmented hearing app is different because it also compresses the very loud sounds that can make social situations like going to the pub, cinema or a birthday party intolerable. This app comes up with features that have the potential to radically change the future of hearing devices. Download it today for your iOS platform devices and it is available for Free. Direct download link for the app is present at the end of this review article.